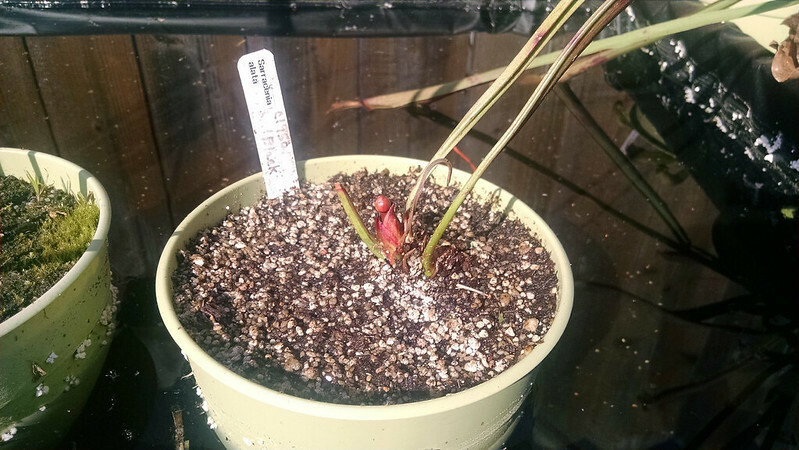 Several exciting new blooms |Sundews Etc. 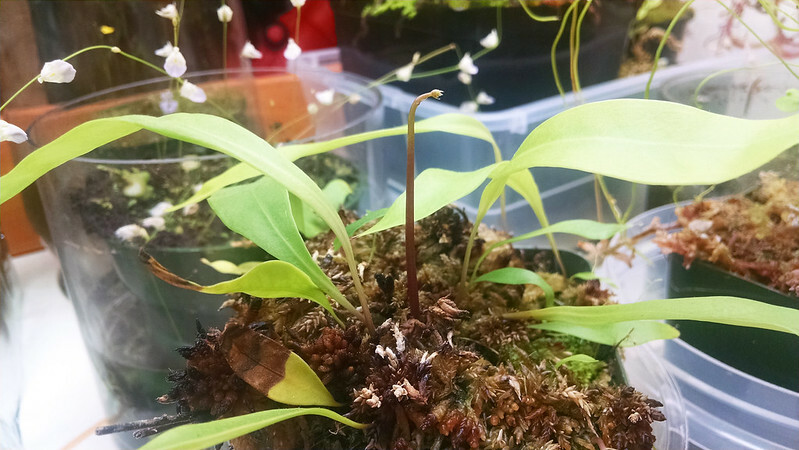 Big surprise in the collection recently – a flower stalk is coming up on my Utricularia longifolia! There's another, smaller stalk off to the right. Yay! Utricularia flowers are always fun, and U. longifolia has some of the best. I can't wait for these blooms to pop. I'll prolly take them to the April BACPS meeting if they've opened by then. Probably pot them up into something nicer too. 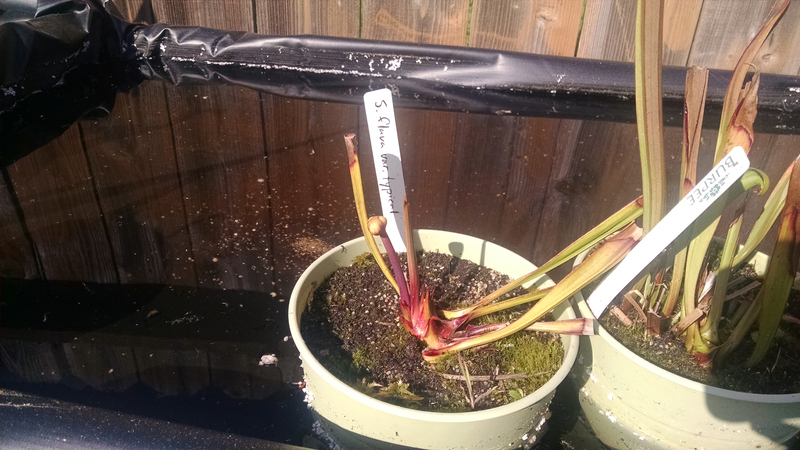 I've also got the first Sarracenia blooms coming up this season – Sarracenia flava (which also has a pitcher coming up) and Sarracenia alata "red black" (one of my recent acquisitions). These buds look like little alien heads. It's funny. These are my first Sarr blooms. Cool! I just trimmed all the old dead pitchers and stuff off of my Sarrs, so we're ready for spring. I am so excited – things are going to look amazing in a couple of months. Finally, the first of the pygmies from my big order back in December has bloomed. 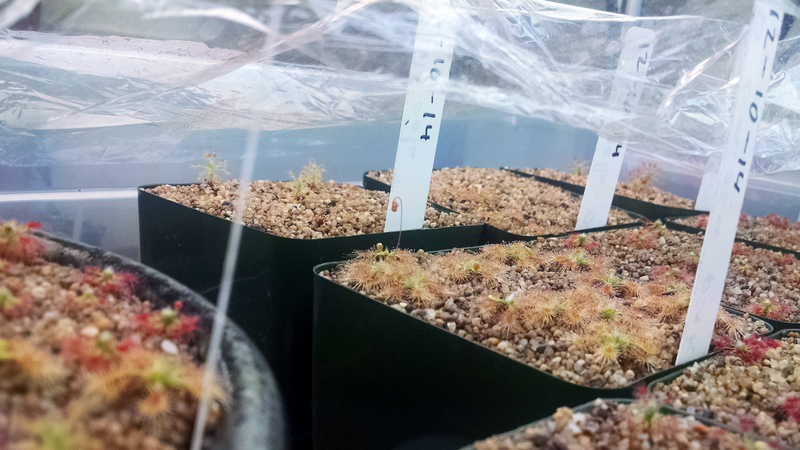 It's Drosera omissa! They're just trying so hard! It only took 9 weeks from gemmae to flower. That's ridiculous. The other pygmies are trucking along (I should do another pygmy roundup soon), but nothing is even close to these guys. I haven't even fed them at all! Pygmies are awesome. Everyone should grow pygmies. A note for any readers of the blog living in the greater Bay Area – the BACPS is having it's first social seed swap this coming Sunday, the 22nd, at the Westbrae Biergarten in Berkeley from 3 to 7 pm. If you're free you should try and come down! The Carnivore Girl will be there, as will California Carnivores' own Peter d'Amato. Bring seeds, gemmae, leaf pulls, and cuttings to swap with other growers, have a couple beers, and geek out with fellow plant nerds for a couple hours. The location is dog and kid friendly, and within easy walking distance of the North Berkeley BART along the Ohlone Trail. Hope to see you there!